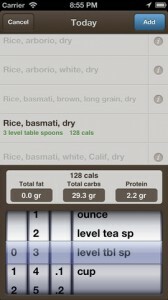 Diet Diary – Calories is an iPhone app developed by Mark Sokolovsky. Billed as “the best diet app for iPhone,” this calorie-counting app works offline and helps people stay fit. When any App Store app declares, “This is the best diet and weight loss planner app!” it sets the bar pretty high for user satisfaction. 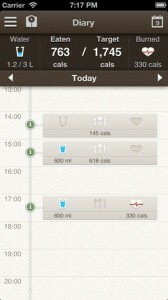 So, does Diet Diary – Calories live up to its own hype, or will it fall short of user expectations? When you start up the app, you’ll go through a quick questionnaire about your age, activity level, height, and weight. From there, you’ll be asked to select a diet mode: maintain weight, each the same amount of calories each day reach a target weight by a target date, or lose a set amount of weight each week. While users can choose either US or metric measurements, there is no way to change the time settings on the app. You can choose your “active hours” (hours you are awake during a day and monitoring what you eat), but those hours will be displayed in military time. Some of the statistics screens seem cramped as well. I’ve used a couple of different calorie counting and activity monitoring apps over the years, most notably SparkPeople and MyFitnessPal. One thing that Diet Diary – Calories has over these apps are the built-in diet plans for users who need meal planning help. There are meal plans for 1000, 1200, 1400, 1600, and 1800 calorie a day diets. Another perk that Diet Diary – Calories has over similar apps I’ve used is related to their food database. A lot of other apps can be rigid in terms of inputting the food you’ve eaten: you might know that you had two tablespoons of cream, but the app you use might force you to report what you ate in milliliters. In Diet Diary – Calories, every food item has a scrolling entry system, allowing you to pick grams, kg, ounces, liters, ml, or fluid ounces as appropriate. No need to convert units! 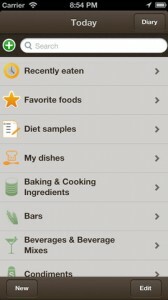 Available with databases in English, Hebrew, and Russian, Diet Diary – Calories has a lot to recommend itself. 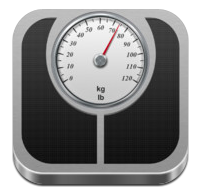 As long as your starting weight is under 499.9 lbs (the most the app will let you select as a starting weight), this app may be useful. 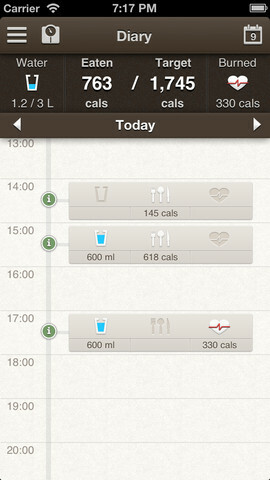 Whether it truly is “the best” app interface for recording calories is a matter of personal preference. Diet Diary – Caloriesis compatible with iPhone 3GS, iPhone 4, iPhone 4S, iPhone 5, iPod touch (3rd generation), iPod touch (4th generation), iPod touch (5th generation) and iPad. Requires iOS 4.3 or later. This app is optimized for iPhone 5.